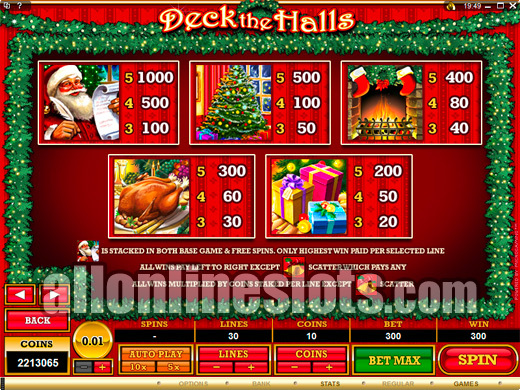 Deck the Halls is a Christmas theme slot released by Microgaming in 2008. It has stacked symbols on the base game and the free spins which mean you can win some serious jackpots including the 2,400,000 coin top award. 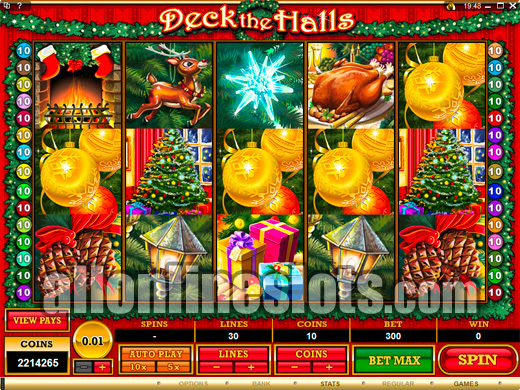 Released in time for Christmas 2008, Deck the Halls is one of a series of festive theme slots from Microgaming. The game uses the Microgaming 5 reel, 30 line format and has stacked symbols as well as a free spin bonus. The game features slots of big jackpots with several ways to win big. 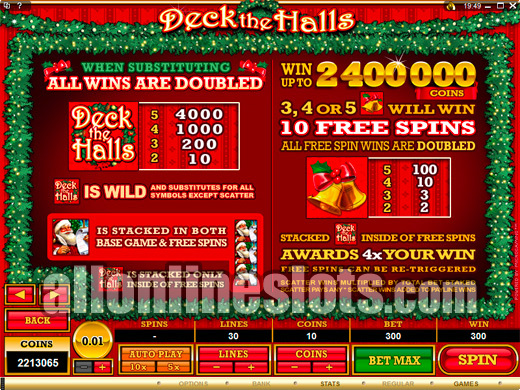 Maximum bet on Deck the Halls is 300 coins or 10 coins per pay line. You can choose from three coin sizes - 1c, 2c and 5c. This means max bet is between $3 and $15 per spin. You can play less than max coins and still have access to all of the games features. The more you bet the bigger the possible wins. In keeping with the Christmas theme you have symbols such as Santa, Christmas Trees, Reindeers, Gifts and Christmas Trees on the reels. In total there are 12 different symbols on the reels which make up a total of 38 unique winning combinations. During normal play the santa symbols are stacked. This means that you can get a whole screen full of Santa's. Five Santa symbols pay 1000 coins so if you manage to get the stacked symbols on all reels you win 1000 coins 30 times for a big win of 30,000 coins or 300,000 at max bet. The Deck The Halls logo is wild and doubles any win it is a part of. Get five wilds and you win 4,000 coins which is the top single line win on the base game. Other good pays on the base game include 500 coins for five trees, 400 coins for five fires and 300 coins for five turkeys. The bell symbols are scattered and pay as long as you get two or more. The pays for 2, 3, 4 and 5 scatters are 2X, 3X, 10X and 100X your total bet. Getting five bells on max bet pays a nice 30000 coins. Three or more scattered bells awards the free spins bonus. Once activated you win 10 free spins with all wins doubled. In addition to the stacked Santa symbols the wilds also become stacked during the free spins. This makes for some huge jackpot possibilities. Get a whole screen of wilds with max bet and you win a massive 2,400,000 coins! Even at the 1c coin size this is a $24,000 jackpot. The stacked wilds also make it easier to get a whole screen of Santa's which on the free games pays 600,000 coins. Deck The Halls is sure to be a popular game all year round. It has some of the biggest jackpots available on a non progressive slot and even the mid level pays are bigger than the jackpot on some games. 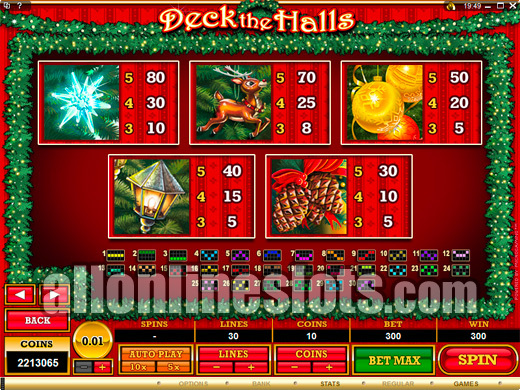 If you like games like Aristocrat's 50 Lions you will love Deck the Halls.